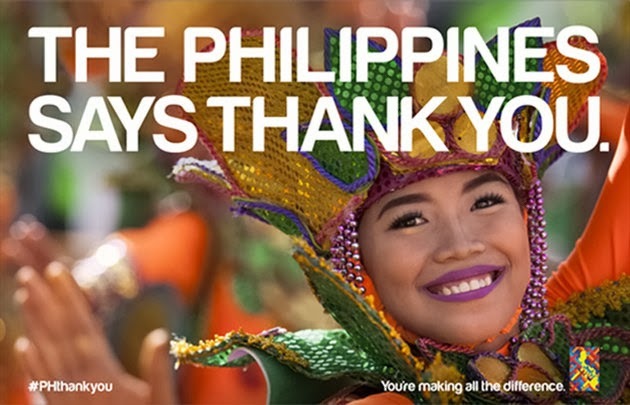 JOELISM - Every Experience is a Bucket List: #PHthankyou | The Philippines says Thank You! On November 8, 2013, the strongest typhoon ever recorded in the history devastated a large portion of the Southern Philippines. Cities and towns were largely destroyed and thousands of fatalities were confirmed. Three months after Typhoon Haiyan/Yolanda, a whole nation wants to show its gratitude to the whole world. This is the Philippines. And this is our way of saying thank you to every one who is helping us rebuild after the storm. The Philippine music industry genius Jim Paredes wrote a Thank You World song to thank all of the countries and its people for helping the Philippines after the deadliest storm. Downloading his song in iTunes can contribute to the ongoing and continuing relief efforts. The Philippines Says Thank You billboard were launched in the following iconic places around the world. The #PHthankyou was started by the advocate leader Gang Badoy. Follow this link for her Esquire Magazine article entitled #PHthankyou. Arigato, Vielen Dank, Tusen Takk, Merci Beau Coup, Shukran Sadik, Kamsahamnida, Xiexie, Càm ón Ban, Gracias Amigo, Toe Dah Ba, Mange Tak, Terima Kasih, Dhanyabad, Grazie Mille, Dank u Well, Merci Vel Molls, Sawadeeka. THANK YOU very much for the storm surge of your LOVE to the PHILIPPINES.